Amenhotep "Amun is Pleased" – Amenhotpe - Amenophis by the Greeks – Throne name Djeser-ka-re, or "Holy is the Soul of Re". Horus name Ka-Waf-Taw "Bull who conquers the Land". 2nd King (Pharaoh) of 18th Dynasty. Ruled for almost 21 years. Reign Approx. 1526 to 1506. Son of Ahmose I & Ahmose Nefertari. Brothers – Ahmose-Ankh & Ahmose Sapair. The temple stands on a terrace above and to the right of the Ptolemaic temple at its North corner at the Workmans village. The temple was originally small and was added to later. 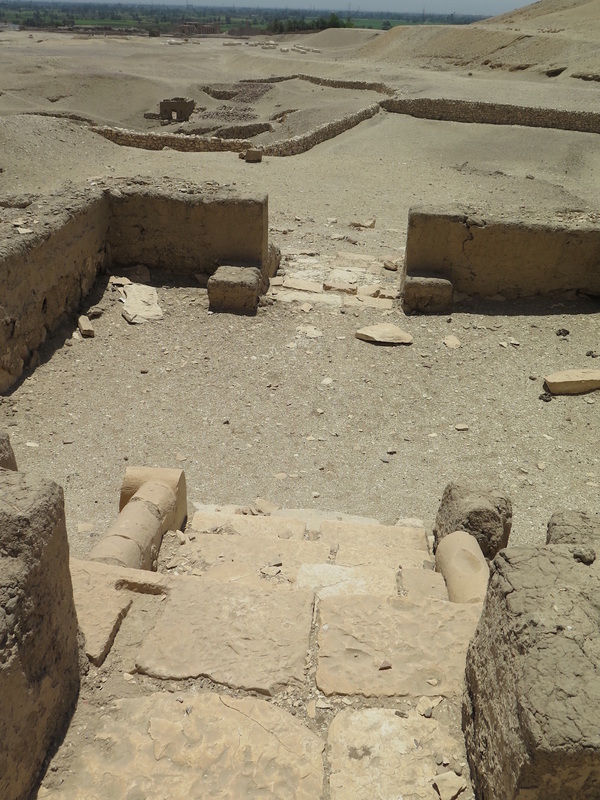 The villagers dedicated this temple to Amenhotep and Ahmose Nefertari his mother, who were both deified. Parts still remain of the temple along with the remains of the nearby Hathor Chapel of Seti I. Excavations and reconstruction work on many of the walls and steps have been lovingly and carefully restored so that future visitors can get an impression of its once layout. What there is to see at this site is worth visiting. The temple consisted of an outer and inner hall, Pronaos and Shrine. Two steps led into the Pronaos, which were decorated with a wall-surround of red, white and black horizontal bands. Amenhotep was deified upon his death and made the patron deity of the village, which he opened at Deir el-Medina. Amenhotep and his mother were especially worshipped here and were revered for almost five hundred years as local deities. His chief architect, Ineni, mentions that he commissioned building work at Karnak. Amenhotep I’s father Ahmose I, expelled the Hyksos kings from Egypt. It is likely that Amenhotep I ascended to the throne as a child where his mother Ahmose Nefertari was regent. Nothing remains of the royal couple, to which the temple was dedicated, Numerous statues were found at the site by Drovetti, Schiaparelli, Bruyère and Baraize and a few events can be seen from inscriptions in private tombs. Amenhotep I led a campaign to Kush. An inscription in the tomb of Ahmose Pen-Nekhbet states that the king also led an expedition to Libya. Peret; the third month in ancient Egypt, was devoted to and named after Amenhotep I, where several rituals showing his death, burial and resurrection took place at Deir el- Medina. He became a fairly major deity with a number of festivals throughout the year. Most houses during the Ramesside period contained in one of their rooms, a scene honouring the two. They were usually depicted with black or blue skin, the colours of resurrection. Amenhotep I Temple Site – Qurna? Apparently there was another Amenhotep I temple site at what is now known as Qurna and is shown on several maps. There appears to be nothing at all left of it and probably it lies under either the modern alabaster factories or houses. I have searched most all of the open areas looking for it but have found nothing, not even a stone block or mud brick. Winlock gives a rough idea of where it is on a map. I have drawn a line of where it is indicated to be - Halfway between Seti I Temple and Hatshepsut’s Causeway. KV39 in the Kings Valley, K93.11 & AN B at Dra Abu el-Naga and possible Cliff Tomb at Deir el-Bahari are all possible candidates at present, although neither has been formally identified as his tomb. The site and location of Amenhotep I tomb has been the subject of much discussion within the world of Egyptology since the late 19th century. It’s location still remains uncertain to this day. The search to identify the tomb of Amenhotep I continues. 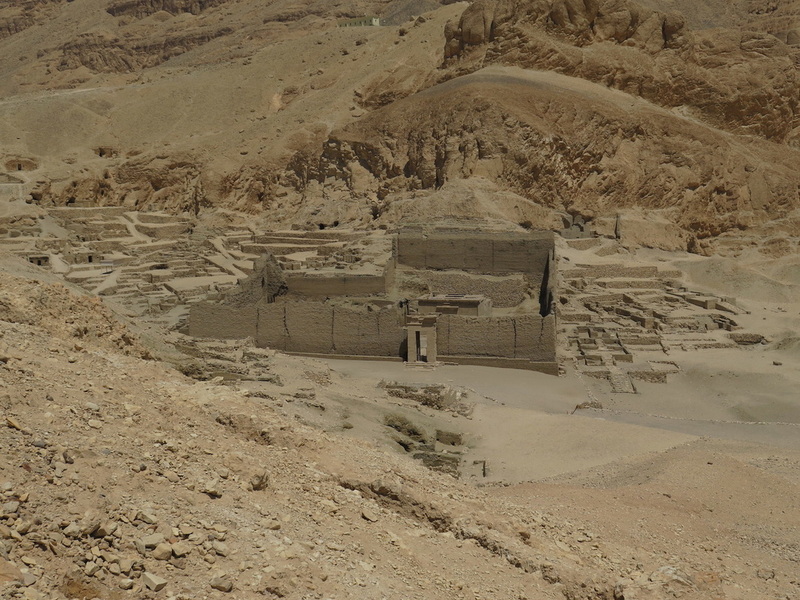 Prof. Andrzej Niwinski, the leader of a Polish expedition, believes the tomb remains undiscovered in the cliffs of Deir el Bahari above the Mortuary Temple of Hatshepsut. On the footpath from Deir el-Medina to the Kings Valley, you arrive at the Tomb Workers Way Camp (Village De Repos). With the Kings Valley being ahead and to the north of the village, there is a path that leads to the left, KV38 is immediately below plateau and this path. All that remains is a hole, the entrance to the tomb. Tomb KV39 is the most formerly quoted for being the original tomb of Amenhotep I. It has been described as one of the most mystifying tombs in the Kings Valley; it may be the oldest cut tomb in the Kings Valley. Victor Loret in 1899 or Macarios and Andraos in 1900 may have discovered KV39. Wigall visited the tomb in 1908 and described it as being a ruin. Rose found a huge amount of objects both inside and outside of the tomb. Most of the finds are still awaiting examination. There are on sandstone in blue paint, cartouches of Tuthmosis I, Tuthmosis II? And Amenhotep II. There were pottery finds from the 18th Dynasty. Rose worked on this tomb for five years and believes that KV39 was Amenhotep I’s tomb. However, the fact that KV39 is so close to the Workers Way Camp, where relationships between tomb workers and tomb robbers would have been made, makes it an unlikely candidate for it being a safe and original location of Amenhotep I’s tomb. Daniel Polz had proposed that Amenhotep I may have had his tomb at Dra Abu el-Naga in Tomb K93.11. K93.11 & K93.12 are two large and similar undecorated tombs that lie side by side, while K94.01 is north east of the previous two. Daniel Polz states that they are of the 17th to 18th Dynasty and as follows. K94.01 – Kamose, last king of the 17th Dynasty. K93.11 – Amenhotep I, second king of the 18th Dynasty. K93.12 – Ahmose - Nefertari, great royal wife of king Ahmose and mother of Amenhotep I. It is possible that K93.11 and K93.12 were built as a double tomb for Amenhotep I and Ahmose Nefertari his mother. No one really knows who was actually buried in K93.11. Many people think it was the final resting place of Amenhotep I. Only in time will we hopefully discover the facts. Amenhotep’s tomb was mentioned in the “Abbott Papyrus” in the British Museum. It dates from around 1100BC, about 400 years after the death of Amenhotep I. It describes an investigation into the looting of royal tombs and the inspection of the royal tombs under Ramesses IX it states “Amenhotep I’s tomb was found to be intact” but priests moved his mummy to a cache in the cliffs of Deir el-Bahari. – DB320. Emile Brugsch discovered TT320 (Tomb of Royal Mummies) on The 6th July 1881. It contained 37 New Kingdom Kings, Nobles and other anonymous mummies. Some of them were the greatest pharaohs of the 17th, 18th, 19th and 20th Dynasties – Tuthmosis II, Amenhotep I, Seti I and Ramses II. It is likely that the infamous Rasaul brothers first discovered the tomb earlier. Emile Brugsch wrote, “Soon we came upon cases of porcelain funerary offerings, metal and alabaster vessels, draperies and trinkets, until, reaching the turn in the passage, a cluster of mummy cases came into view in such number as to stagger me". The mummy of Amenhotep I had been recovered from a reused sarcophagus, deposited in the 21st dynasty by the priests of Amon. The mummy is the only royal remains on which was inscribed "Jt n Kmt", "(the) father of Egypt". The mummy still remains unwrapped to this day and is in the Cairo museum wearing a wooden mask covering his face decorated with a uraeus and wig. Very little is known of this building where the name and function of it remains uncertain. 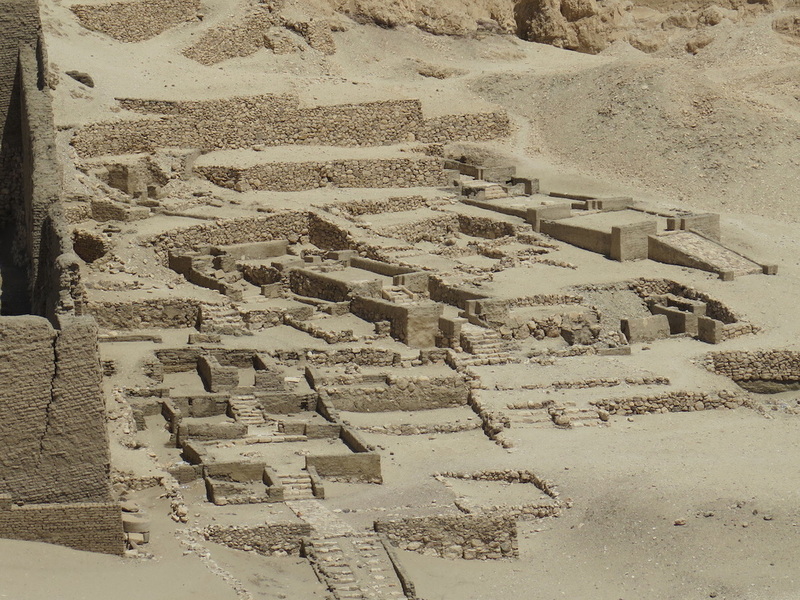 The construction lies on the site chosen by Queen Hatshepsut to build her funerary temple. The architect Senenmut reused some of the stone blocks. Tomb AN B is a most credible candidate for Amenhotep I’s tomb. Its location is on a plateau near to the top of a slope 350 metres NNW of K93.11. It most certainly was a royal tomb from the early 18th Dynasty. Carter, who excavated the tomb, stated that it belonged to Amenhotep I. Others disagree. Remnants of funerary equipment have been dated to the end of the 17th dynasty and the beginning of the 18th dynasty. A wrapped mummy of a child was labelled Amenemhat, son of Amenhotep I. Finds also included a bust of a woman, who may be Ahmose-Nefertari and pieces of stone vessels with inscriptions of Ahmose I, Ahmose Nefertari and Amenhotep I on them. Gurnawis discovered the tomb around 1907. At this time, items started to appear on the international antiques markets showing the names of Amenhotep I and his mother Ahmose Nefertari. It was soon realized that possibly, the missing tomb of Amenhotep I had been found. Carter was soon on its trail. Several items were found in the tomb that showed it had been used more than once. There were remains of several wooden coffins from the 22nd Dynasty. Mission Rock – Prof. Andrews Niwinski – Leader of a Polish team. 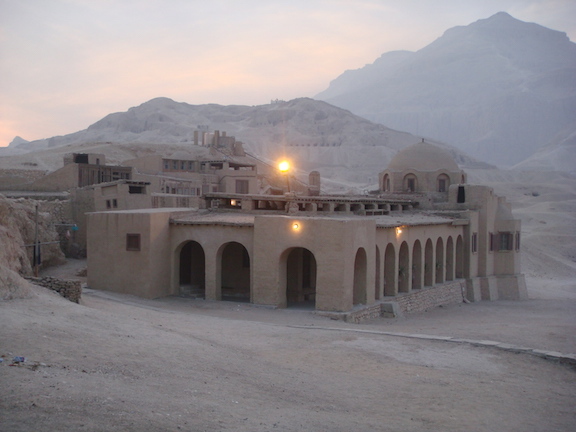 The mission was to protect the temple of Hatshepsut from falling rocks from the cliffs above. 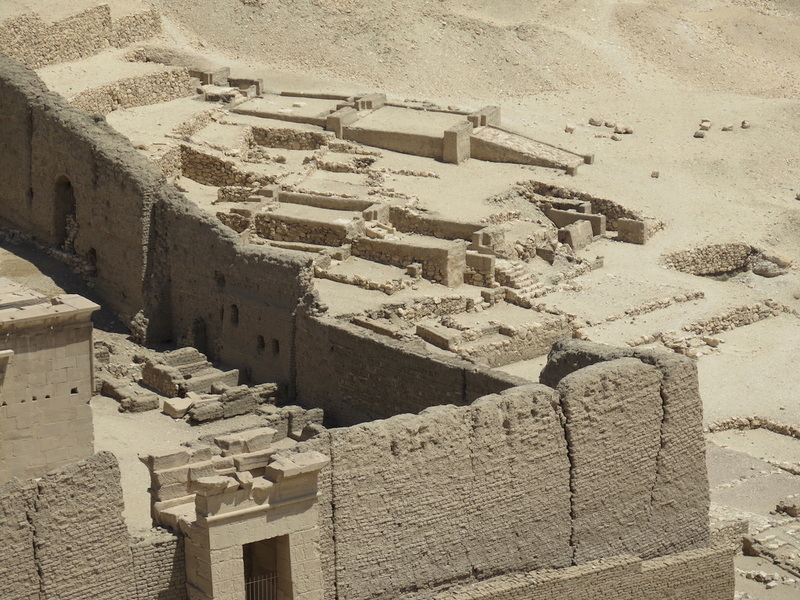 During their work at the cliff face in 2014, they found that they might have discovered a tomb of a Pharaoh! It is supposed that the famous architect Ineni in the sixteenth century. BC has created a vision of placing it right there, under the "roof", the royal tomb of Pharaoh Amenhotep I. 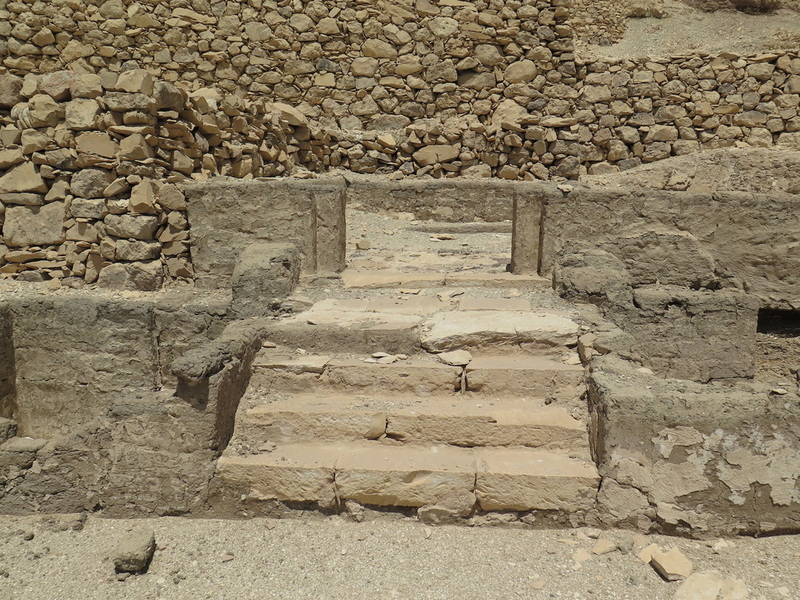 This possible tomb would have been built after the catastrophic rainstorm that destroyed the existing necropolis of the kings of the 17th Dynasty at Dra Abu el-Naga. Recognizing the need to build royal tombs much higher and with drainage designs to take rainwater away from the tombs to keep them dry and safe. 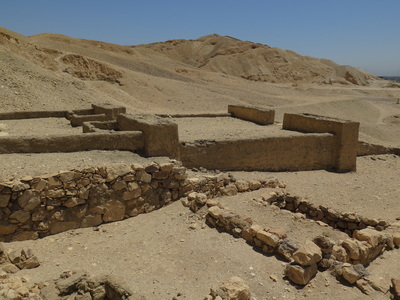 Prof. Andrzej Niwinski, the leader of the Polish expedition, believes the tomb of Amenhotep I remains undiscovered in the cliffs of Deir el Bahari above the Mortuary Temple of Hatshepsut. It has been 500 years since "the Abbott Commission " wrote her inspection report during the reign of Ramses IX (last quarter of the twelfth century BC) and confirmed that the tomb of Amenhotep I was intact. When I asked the Egyptologist whose tomb he thought it was, he said, “We think we know who is the owner” Sadly for me at that time, he did not divulge a name. However, things have developed since then. So, is this Amenhotep I’s tomb? I dedicate this article to my dear friend Barbara Peterken Who inspired me to research into it and put this article together?